A One To One Relationship is when one record in one FileMaker table occurrence is related to one and only record in another FileMaker table occurrence. 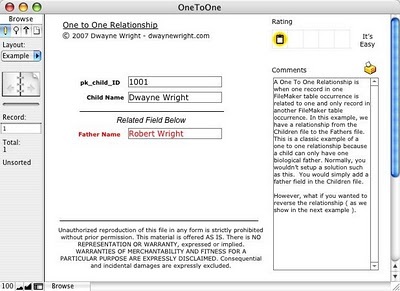 In this example, we have a relationship from the Children file to the Fathers file. This is a classic example of a one to one relationship because a child can only have one biological father. Normally, you wouldn’t setup a solution such as this. You would simply add a father field in the Children file. Off the top of my head, I cannot think of a reason you would have a one to one relationship in current version of FileMaker. In the past, there were a few techniques that used one to one relationships for workarounds to limitations in FileMaker. However, almost all of those limits are no longer an issue. For example, you can add a field in a hosted FileMaker database but that has NOT always been the case. There used to be a one to one relationship technique called a “live splice.” I first saw this in a training class give by Chris Moyer and Bob Bowers. You would add a related field with the auto create option to mimic a new field. Then later on you would integrate the two data sets. I’m not going to go into detail about the technique. Again, because as of FileMaker 7, it’s no longer needed technique because you can create fields on hosted solutions with these versions. .